If you find yourself detached from your emotions, read one of Sneed's short stories, and it will cause you to look at yourself from a new view. From story to story, the author delivers truth and meaning to the reader, who can't help but be absorbed into the world of each protagonist. With an underlying feeling of selfishness, the characters prove that life is painful, regardless of a role one plays in the world. The angst-ridden, trying personalities intensely attempt to assert their power and needs, laying their story open raw. Displaying her characters flaws and insecurities, Sneed exposes us to thoughtful and caring people who question life, yet proceed in living. Sneed teaches creative writing and literature courses, and you may imagine her creations spring from the classroom. The slices of life may be drawn from her experiences and her characters may be extensions of her students. When faced with life's confrontations, compassion and sensitivity pour into every page, garnering steps towards redemption. Thoughtful and introspective artists and everyday people arise in the stories, which simply demonstrate the struggle of everyperson. 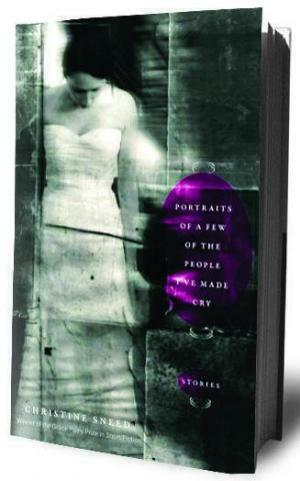 Subtle and solemn, Portraits of a Few of the People I've Made Cry will knock you out again and again.